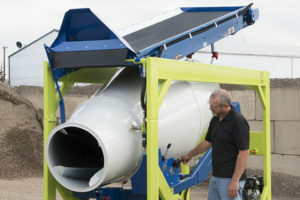 A 4.1 cubic foot cement mixer or a 1.94 cubic foot mixer? 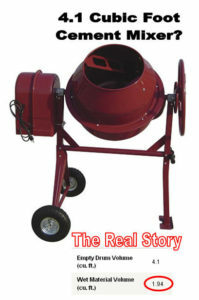 There is misleading information that accompanies the sale of small cement mixers today. There are retailers that advertise large capacities in the bold headlines, and then they hide the real capacity from the buyer down in the spec sheet. It is only when you dig deeper that you will find the actual mixing capacity of their equipment. Obviously, the marketing and sales departments of each manufacturer want to show their product in the greatest light. They want you to believe that you can yield higher volumes of wet concrete and very high production rates per hour. Yet, we have discovered that the stated capacities differ greatly from actual mixing capacity and those hourly production calculations are nothing more than a sales pitch gone wrong. This misinformation represents a real problem for those who are attempting to find a mixer to meet the demands of a specific project. For example: If you need to produce 20 cubic ft of material per hour, then you would want to know accurate batch sizes and correct mixing cycle times before you spend money on a mixing solution. There should be some truth in advertising when it comes to the sale of contractor cement mixers, but alas there is slight of hand. We suggest that you never purchase a cement mixer without discovering the truth about the wet material capacity of the equipment. 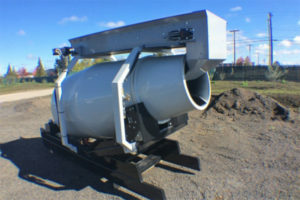 We spent some time exploring an online site that sells cement mixers. They obviously sell these mixers by highlighting and listing their capacities. We found a 4.1 cubic foot mixer that seems like a great price for the capacity that was advertised. 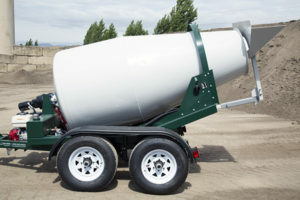 They called it a 4.1 Cubic Foot Cement Mixer… If you calculate this 4.1 cubic foot mixer by the cost of capacity, then you should be buying a mixer at $72.93 per cubic foot of capacity (It is advertised at $299) But this is not accurate, because the 4.1 cubic foot mixer will only mix 1.94 cubic feet of wet concrete in each batch. So your mixer is really costing you $154.12 per cubic foot of production capacity. 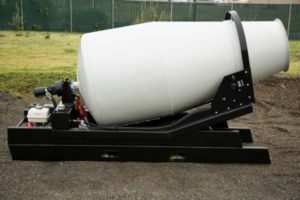 A call to the customer service department of this retailer found that the 1.94 cubic foot wet mix capacity is due to the limitations of the electric motor to spin the weight of the concrete in the drum. The 4.1 cubic foot advertised capacity is how much air the unit will hold. The real issue is that the capacity disparity is misleading when you are attempting to purchase a mixer based upon mixing output. You are actually spending money on air, not concrete mixing production if you are to believe the advertised capacity. If you understand that what is advertised as cement mixer capacity is much higher than what you are getting, then you will be a wise consumer of these mixers. A quick review of various mixers shows that actual mixing volume is about ½ of what is advertised, but not all retailers share this fact. You may be asking why don’t they just sell at the accurate capacities? A great question, for which you should demand an answer! For the record… Cart-Away cement mixers will produce as much or more than what is stated in any of the advertising claims. We tell it to you straight!